Putting clients in the heart is the best way to build the tomorrow’s bank. 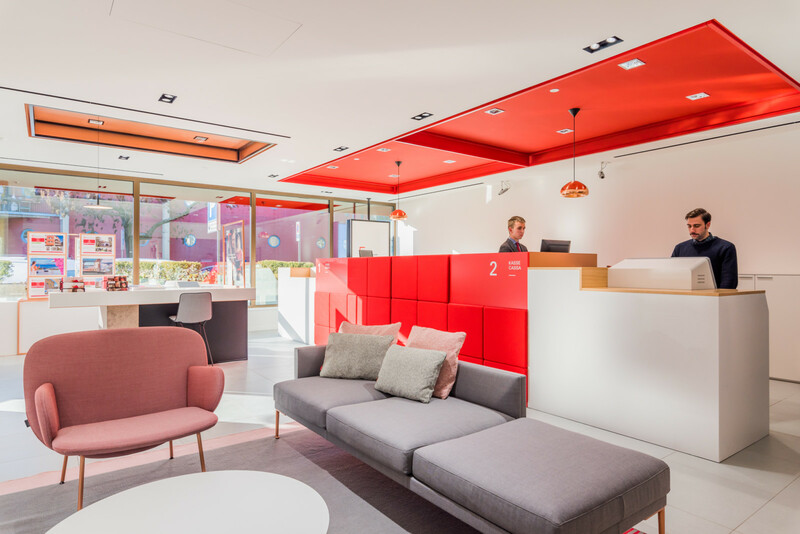 Sparkasse Bank becomes an experience bank, made by the people for the people, which – altogether – are able to create innovative solutions that generate good and desirable effects. This is possible also thanks to the positively interaction between the bank and its local area. 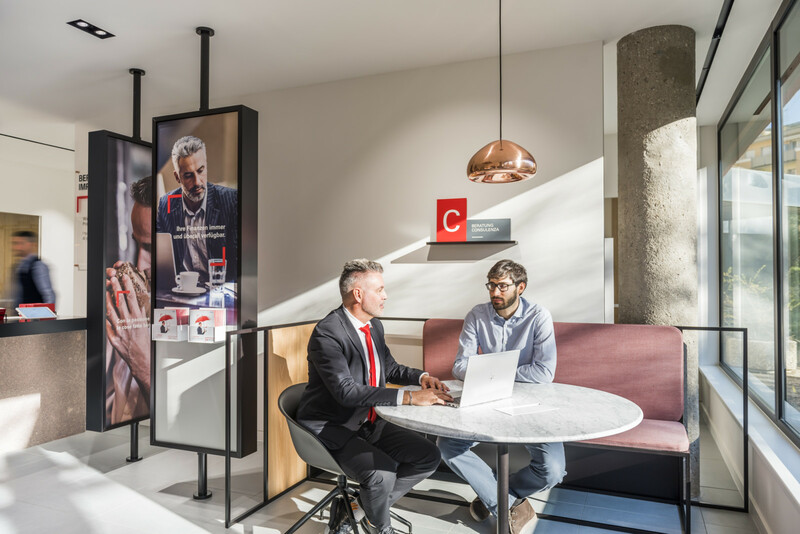 With 120 branches and the headquarters set in Bolzano, Sparkasse Saving Bank represents the most important credit institution in South Tyrol, much related to the historical and cultural background of the local area. Following Sparkasse Bank’s high values of professionality, total trust and transparency with clients, DINN! fully redesigned the branch model and its relational aspect into a refined premium and smart-tech landscape. A bank that looks like a boutique. The innovative concept designed by DINN! 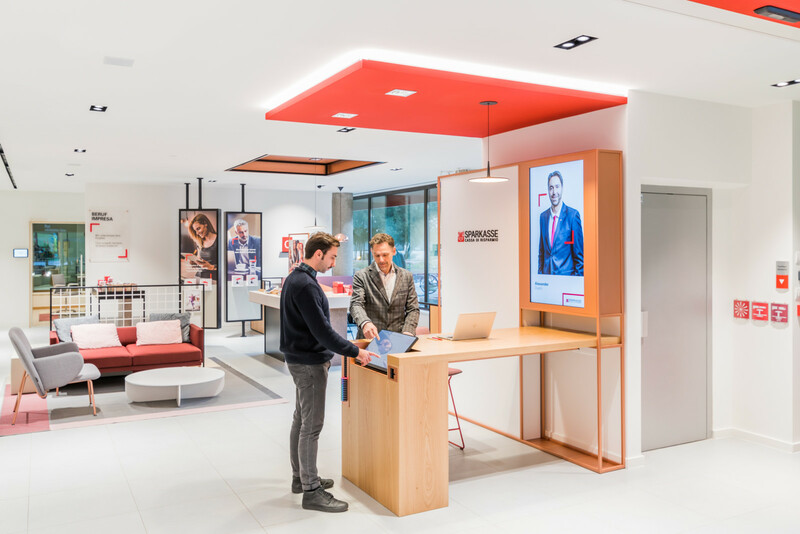 transforms Sparkasse’s banking model enhancing its premium positioning. 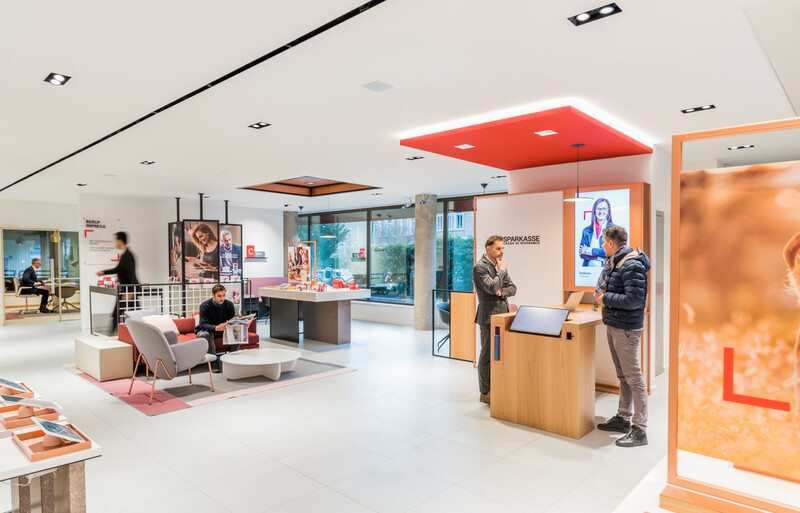 The real protagonist becomes the client, which can easily move into a smart and elegant space, thought to optimize the contents, stand out the details and improve the positioning of the bank – that now is more affluent. Moreover, in the accurate application of the materials, it is visibly remarkable the reference to the background and the local spirit of the bank, with an authentically contemporary accent. The concept designed for this model bank considers new spaces for the clients and for the consultancy, in order to convey new inputs through a different way of communicating and selling products. The introduction of the bank offer sees a physical and digital interaction that let clients manage independently the transactions or, at their complete discretion, guided by staff members. DINN! 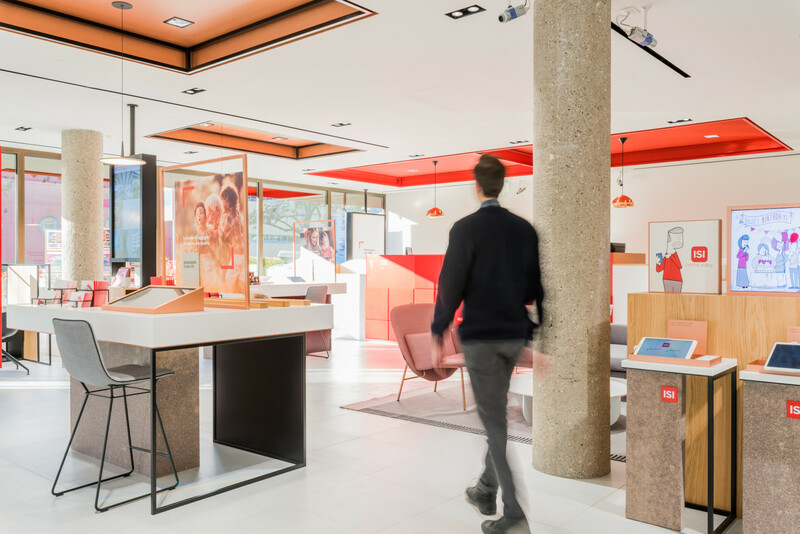 created new customer areas to fully experience Sparkasse’s lifestyle: attraction, selling and interaction areas. They are thought to enhance the space and discover new services, and also to hire and secure customer loyalty. Communicating the bank products in the same way the retail business does, now is possible. DINN! designed a new strategy to meet the need of the client, with a focus on the sale and pre-sale inside the branch, within the area dedicated to the interaction with clients. 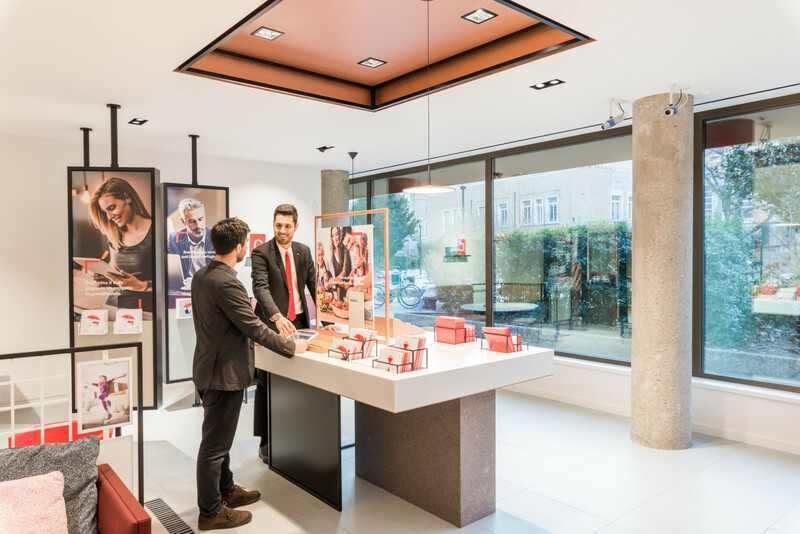 Sparkasse Capsules Collection are new worlds to discover: Free Time, Young, Home, Family, Health, Job. It is a collection made of few elements, easily matching and exchangeable, that is set side by side with a selection of extra-bank products in order to highlight the content of the Capsule each product belong. The collection focuses on the specific need of the client, in order to generate new opportunities of selling, and gain more time and resources for the cross-selling. 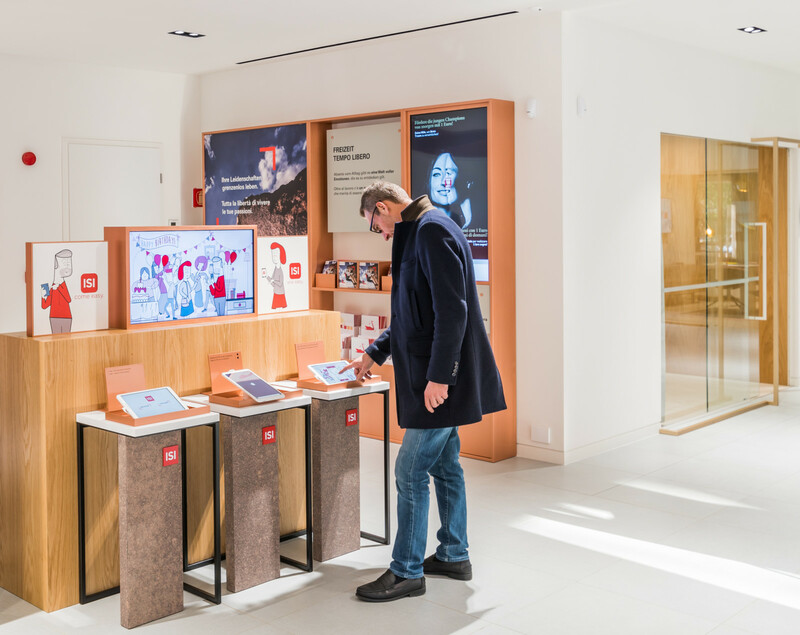 Sparkasse Capsules Collection approaches the need in a storytelling way that creates an ongoing experience with the client, that now is more and more at the heart. It is not only the simplification of the process; it is a better visibility for the bank offer, in a unique and remarkable style. 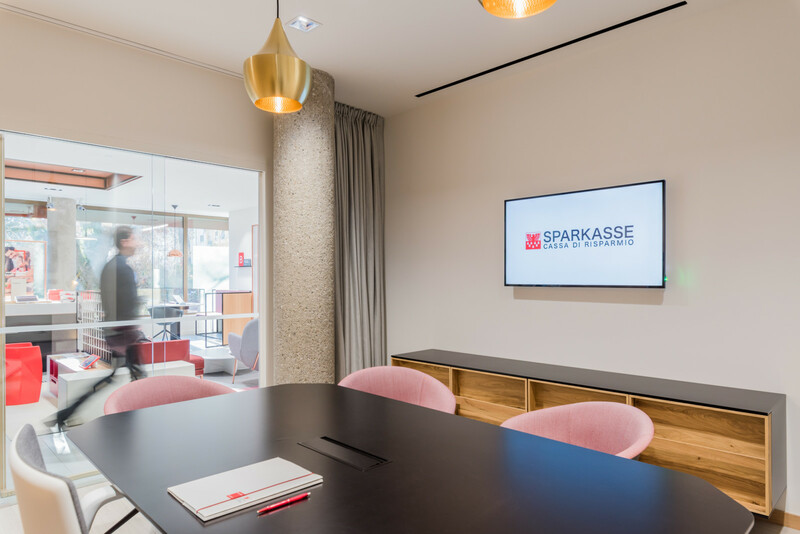 Sparkasse Bank represents an innovative way of bank, based on a client centric model that boosts the new premium bank positioning, in accordance with the work shared with the Top Management, step by step: from the context analysis up to the development and the creation of the concept. You are welcome: the new space is thought to satisfy the needs and the requests of the clients, through various ways of interaction, mostly handled by the bank staff. The staff is dynamic and attentive, with advisory and selling skills due to create and strengthen the relationship with the client. Looking forward to meeting the client: the interaction within the space now is perfected. Being at the heart of the experience, the client is guided by the staff or he can act and explore on his own, if preferred. The noticeable growing connection between physical and digital landscapes represents the real added value provided by DINN!, as the result of a balanced mix of innovation, tailor made interaction and simpler processes. In addition to the high-quality customer experience, which allows clients to satisfy their own requests through diversified ways of interaction (from custom-built consulting to self-service), a new way of communicating, interacting and selling products plays a leading role in this process of renovation. Towards the satisfaction of the need: products, services and spaces of interaction – now set in an innovative design -, positively express their own function in an intuitive way, facilitating the relational approach. 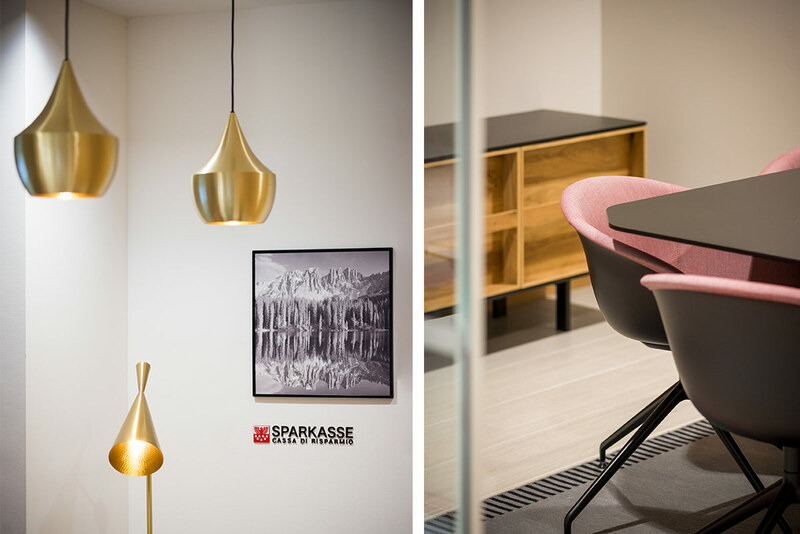 Sparkasse Bank has opened their first two main “bank boutique” branches in Bolzano and Vipiteno, during December 2017.